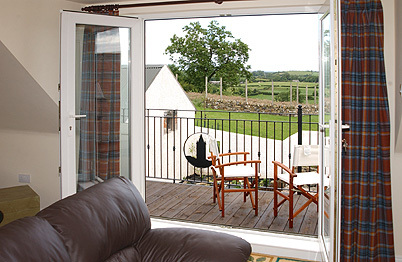 French doors from the Gallery give access to an exterior balcony with deck chairs overlooking the stables and courtyard at the rear of the cottage. You will also be able to see the surrounding countryside and on a clear day there are views all the way to Scrabo Tower. The wrought iron railings around the balcony were designed with this view in mind and have an insert detail of the tower itself. At the front of the cottage there is a garden, car parking area, a stone built-in BBQ and a picnic table constructed from an old tree trunk. The garden is landscaped with shrub beds, stone walls and a rockery, and in the summer there are containers and hanging baskets all around with flowering plants. A gravel lane leads down between the trees for 100m to the gate. There is plenty of open space for children to run around and adults to enjoy an evening stroll. Above: Part of the Nature Trail. 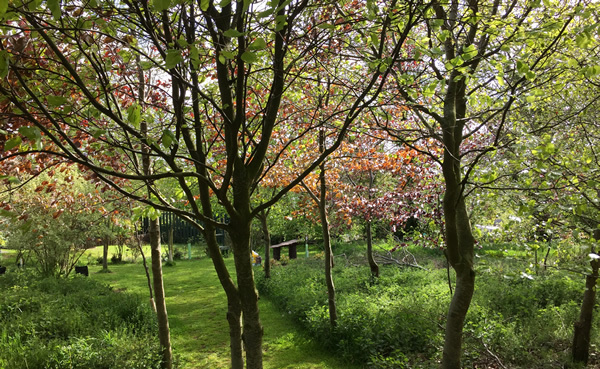 At the rear of the cottage there are stables and horses and a paved yard leads to a secret garden and access to the Glassdrumman Nature Trail. Above: View of the balcony. Set in 2.5 acres, the nature trail is a series of tracks through several thousand native Irish trees planted about 14 years ago. The area was originally two ordinary fields but slowly many wild flower species such as Bluebells, Wood Sorrell, Birdcherry, Bushvetch, Cuckoo Flower, Lesser Celandine are starting to reappear and can be seen at different times of the year. The nature trail will lead you through to the Heritage Orchard, also planted about 14 years ago. The orchard has around 70 apples trees, all old Irish varieties such as Bloody Butcher, Irish Molly, Kilkenny Pearmaine, and Ardcairn Russet, to name a few. The orchard is particularly impressive in April/May during the apple blossom period when all of the trees are covered in white flowers. More impressive is the end product, Glassdrumman Cider. The apples are harvested in the autumn and by the following summer our cider is ready to drink. We make around a thousand bottles every year, half dry and half sweet, and both types have had great reviews. 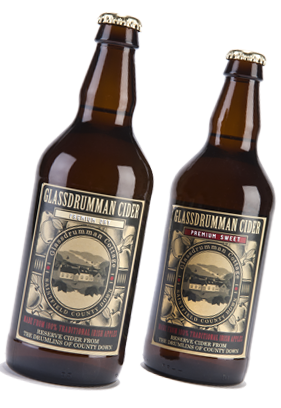 Complimentary bottles of Glassdrumman Cider are provided for visitors and guests staying at the cottage.